ReadyNutrition Guys and Gals, this piece is to laud the many wondrous benefits of coffee. Really, I love it without all of the benefits that we’re going to mention, and drink it by the gallon. There are a few studies that came out about coffee that I think you’ll find interesting; therefore, there’s a little in this article for everyone. Let me take a sip of my coffee, now, and then we’ll continue. Ahh, that’s good! Now, coffee beans happen to be the seeds of Coffea arabica, a cash-crop harvested in Central and South America, Africa, and Asia. The beans are harvested nine months after the plant is in its flowering stage. Then they are dried, either by the sun for about a month, or with machines. Why many say this beverage is unhealthy is all the “extras” you put in your java. Cream, artificial sweeteners add extra calories and fat to coffee. If you drink it without any of these, then you receive the most health benefits. As a naturopathic aid, coffee has quite a few uses. It can be used to treat nonspecific, acute diarrhea. This is diarrhea that isn’t long term, and could come from a number of different stressors, most of them not disease-related, such as severe fatigue and overwork, or a sudden change in diet. Caffeine (the main constituent of coffee) is also a diuretic, which means it causes urination. For this reason, it isn’t used in diarrhea caused by diseases of the stomach and intestines, as it will help with the diarrhea but cause you to lose water through excessive urination. The caffeine restores mental alertness, and these stimulating effects occur within just a few minutes after ingesting it, in this case with your cup of coffee. Although we’re primarily concerned here with it as a drink, caffeine as well as ground coffee is available in other forms, such as tablets and as an ingredient in a mixture. It takes a lot to overdose, and the lethal dose for an adult is 150 to 200 mg of caffeine per kg of body weight. To place this into perspective, if you weighed about 120 lbs., you would have to drink about 75 cups of coffee before you checked into the big Starbuck’s in the sky. An article by Maggie Fox entitled “Study Finds More Evidence Coffee Can Be a Life-Saver,” explains some little-known benefits of drinking coffee. The study comes from Harvard University’s School of Public Health, in which it explains that coffee can actually help you live longer. Frank Hu, a professor of nutrition and epidemiology helped run the study, and he and his colleagues found that coffee consumption helps with diabetes, cardiovascular problems, feelings of depression/suicide, and can lead to an overall lowering of mortality risk. The study found that having 3 to 5 cups per day can lower the risks associated with these health hazards. 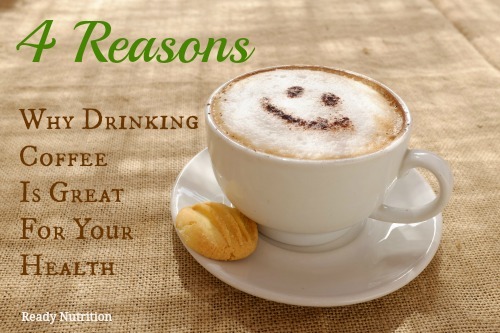 Coffee happens to be the Number 1 source of antioxidants in the American diet. Antioxidants are chemical compounds that offset the damage by free radicals to your cells that occurs on a daily basis. The studies went on to tell how inflammations in your body’s system and resistance to insulin is diminished in diabetic patients by several ingredients in coffee, such as quinides, lignans, and magnesium, among others. The reason the study is very reliable is this: it was taken from a sampling of 200,000 doctors and nurses over a period of a decade that tabulated their habits. The beneficial effects were with (regular) caffeinated coffee as well as (“unleaded”) decaffeinated coffee. In addition to the points made above, you can make your coffee even healthier by adding these superfoods to your favorite brew. It must be mentioned that your coffee grounds can do wonders for your garden. Here are 14 genius ways to use coffee grounds. The final say-so rests with your happy, smiling, family doctor. Obtain his smiling permission before undertaking any regimen of therapy suggested in the referenced article or using any information in this one. If coffee is something you normally enjoy (such as I’m enjoying this very moment), then this article should have given you some food for thought that is positive reinforcement to “our” indulgence in coffee. So, bottom’s up, and keep up the prepping and learning!